Every so many winters, I get a sudden hankering for Cream of Wheat. It's not that I actually like the stuff. In fact, I find it kind of gooey and lumpy and pasty and gross .... but in a good way. Mostly it reminds me of my childhood, my mother standing over the stove cooking old original Cream of Wheat that took a good half hour to prepare, loading it up with milk and sugar, and then gently foisting it on me just before school. I always felt well protected from Winter's Chill with Cream of Wheat inside my tummy, even though it did little to prevent me from getting regularly beaten up by half the schoolyard from Grades 1 through 5. And so it was on a cold day last week that a familiar hankering for that wholesome goodness, nourishment, and marginal taste once again struck. I bounded out of the house to the nearest SuperFresh and right to the aisle where Cream of Wheat 2012 was regularly being purveyed. But which Cream of Wheat to buy? This is a product that has more speeds than a racing bike. 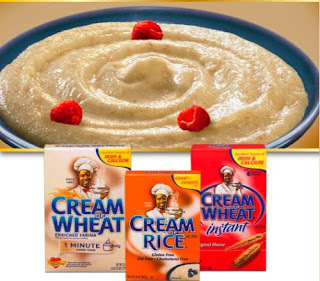 There's Original Cream of Wheat (takes 30 minutes), Quick Cream of Wheat (bringing it down to five), Instant Cream of Wheat (just one short minute), Mix and Eat Cream of Wheat (it's there for you whenever you want it, baby! ), and new It's Cooking in the Box Cream of Wheat. I opted for tradition but with a 21st Century attitude and selected the five minute variety. But as I lifted the box towards me, I saw something that truly surprised me. They still have that old-fashioned black man on the box! He's still got a chef's hat on, he's still smiling graciously, and he's still serving me a bowl of Cream of Wheat. Me, a white guy!!! This doesn't seem right, I thought. Just then my friend Sheila Farbman happened down the aisle. "Hi, Perry! What ya getting?" "Oh, hi, Sheila. I was just .... um .... grabbing some Wheaties, Breakfast of Champions!" "But those aren't Wheaties. Wheaties are in an orange box." "Well, Sheila, I don't think I ever mentioned this, but I'm a little color blind." "But the size of that box is way smaller than a Wheaties box." "I'm so sorry. Well, let me help you then. We'll just put back this Cream of Wheat..."
"Cream of Wheat!? This is Cream of Wheat? Thank God you came along!" When Sheila left, I grabbed back the Cream of Wheat box off the shelf and headed for the check out line. Sheepishly sliding the box over to the check out guy, I looked upward and away as if I were considering writing a term paper on the ceiling tiles. "Cream of Wheat!?" I blurted out in a voice many octaves above that of the very young Wayne Newton. "No, no, no, I meant to buy Wheaties!" "What I wanted to say, sir, is if you want the Cream of Wheat, it's two for one today. You could go back and get another." "Uh, no thanks," I sputtered and leaped out of the store like I was running from Geoff Treegoob, one of the toughest of the fifth grade bullies. First thing I did back home was some research. Turns out some people do think the Cream of Wheat man has outlived his time. Others believe the image has been transmuted to stand simply for quality. I guess it's not my call to make. I will, however, make the call about the stuff that's in the box. I cooked it up in five minutes and scarfed it down in seven. Tasted like Plaster of Paris .... but in a good way. So guard your family with hot Cream of Wheat! .... and unceremoniously dumping its contents on my head. That's hot nourishing, gooey, lumpy, pasty, and gross Cream of Wheat for you. One breakfast cereal. Yes, indeedy. But I prefer oatmeal. The lumps are lumpier and the color is ookier, but the taste is blander. The oatmeal mantra: It sticks to your ribs. The reality: It also sticks to the pan it was cooked in, and the spoon that stirred it, and the bowl in which it was served. When it's all over, you can use the left overs to glue wallpaper. Can your Cream of Wheat do that?? Yes, Cream of Wheat does bring back the good old days when I used to eat it (and still do from time to time). Definitely a winter warmer upper! Glue wallpaper? I think Cream of Wheat can cement your stomach to your colon! And I still haven't gotten it out of my hair. Thanks, Libby. It is a winter warmer upper. But once I get past all the issues, it's spring already.